Located in Sangolda, this is an offering of an entire villa with four bedrooms that can comfortably accommodate up to twelve people. 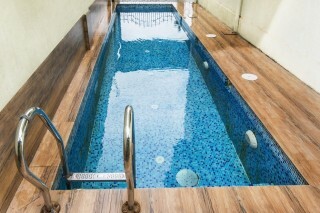 The property flaunts a private swimming pool for those of you who love a cool dip to rejuvenate. The famous Mae deus Church is located 3.5 km and St. Anes Chapel is 3 km from the property. Your Space All four bedrooms are spacious and furnished with comfortable double beds and side tables. The rooms also have sleek cupboards for your storage needs and flat-screen televisions to keep you entertained. Generous windows let in ample natural light in all the rooms. Every room also has a small sitting area for you to enjoy a good read or a hot beverage. Dressers add to the convenience. The en suite bathrooms, done in tones of beige and brown, are tiled and equipped with modern sanitary ware. The living room is furnished with plush couches in muted tones, a coffee table, and a television, making it the perfect setting to spend quality time in with your travel companions. A well-appointed and extremely spacious kitchen—equipped with an induction stove, a microwave oven, a double-door refrigerator, a water purifier, and a washing machine—is available for use at an extra charge. 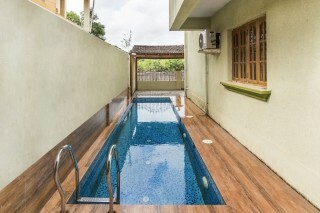 The villa also features a swimming pool, ideal for a refreshing swim after an afternoon at the beach. Guest access You are allowed access to the entire property on offer that consists of a private swimming pool, four charming bedrooms, a living room, and well-appointed en suite washrooms. We provide ample parking space as well, in case you are travelling in a vehicle. Guest interaction We provide you with the services of caretakers and co-staff to assist you, maintain cleanliness, and help you with your itinerary. Also, we are just a phone call away. Getting around Our holiday home is 32.9 km away from Goa International Airport. You can hire a cab from here and reach the property conveniently. Also, we can arrange pick up and drop service at an additional charge. 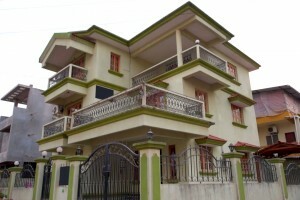 Thivim Railway Station is 17 km away, and the nearest bus stand is Mapusa Bus Stand (7.4 km). Additional information Some of the house rules are- 1. You are requested to provide a valid ID proof at the time of check in. 2. Our standard check in time is 12 pm and check out is 11 am. 3. Housekeeping staff is present at the property to assist you. We request you to be courteous with them. 4. 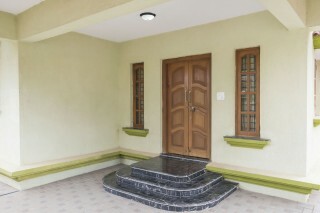 Please treat our villa as you would treat your own home and help us keep it beautiful. 5. Please refrain from bringing your own pets. "In proximity to sightseeing and shopping spots"
I stayed here with my family for five days and it was everything we could have hoped for. The booking process was easy. Also the check-in and check-out was smooth and well-managed. The rooms were cleaned and nicely decorated. It was spacious and had all the facilities, which we saw on the website. The place was exactly like the pictures and looked even better in person. The pool was clean and we had fun having access to a private pool! The kids and youngsters had the time of their lives. Another plus point of this villa was that beautiful churches and tourist spots were so close! We had no difficulty navigating through the city as the caretaker gave us some wonderful tips. Overall it was a great experience. I am reallyyyy impressed with the management of this place and the professionalism shown by the staff. 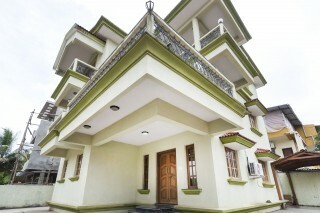 This is a great villa if you are vacationing with family as it is in a safe yet accessible location. The Villa property was neat..Good value for money. Any concern whatever it may be was promptly dealt with the contact person. The local help present inside the villa was very helpful. Rooms were very neat and clean with very upscale bathroom amenities. Would definitely recommend anyone who has a vehicle or is planning to hire a local transport there for outings as around 7Km from Bagha beach. Brilliant house.. 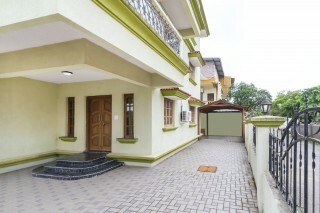 Extremely well maintained.. Courteous house keeper.. Had a great time living here.. Altho located a lil away from the hotspots, it is still quite close to restaurants, wine shops and supermarkets. Highly Recommended!! 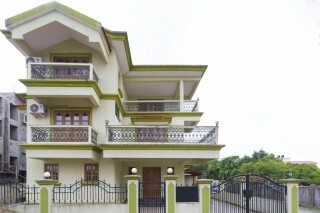 Verda Villa wouldnt have been half as good had the caretaker (Suresh Bhaiya) not been there. The stay was amazing. The house was worth its price. NO REGRETS! Given a chance I would definitely come back for a stay at the place. It was a great experience.. pool is clear. Location of property is very good. Baga beach is 7 km away. Ideal stay for family.